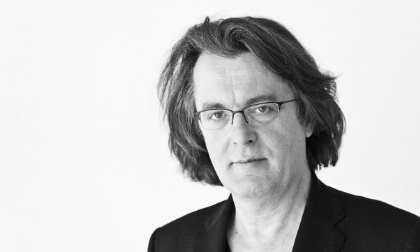 Pascal Dusapin, born on May 29, 1955 in Nancy, was introduced to music at an early age. When he was 10, Dusapin discovered the organ, an overwhelming passion that would carry him through his chaotic and unconventional adolescence. But when he first heard Arcana by Edgar Varese at the University of Vincennes when he was 18, his life was transformed. From that moment, he knew that he would devote all of his time and energy to composition. From 1974 to 1978, he studied devotedly with Iannis Xenakis, whom he considered to be the modern descendant of Varese. Xenakis became his master in thinking differently, broadening his horizons to include architecture and mathematics. In 1986, with the encouragement of Rolf Lieberman, he launched himself into the composition of his first opera, written in close collaboration with the author, Olivier cadiot. Roméo & Juliette diverges from conventional intrigue and genre. It is a musical-literary revolution where each word is chosen for its sound and its rhythm and is then tightly intertwined with the completely unfettered music. Medeamaterial, based on the work by Heiner Müller opened at the Théâtre de la Monnaie in Brussels in 1991. This was followed by To be sung, based on Gertrude Stein’s work, and was created in tandem with the great mixed media artist and light designer, James Turrell, at the Théâtre des Amandiers in Nanterre. In 2003, Perelà, Uomo di fumo, based on the work by Aldo Palazzeschi, opened at the Opéra Bastille in Paris. Dusapin went on to write the librettos for his two latest operas: Faustus, The Last Night which opened at the Staatsoper in Berlin in 2006 and Passion which premiered at the Aix en Provence Festival in 2008. Throughout the writing of his operas, various other works were born, including seven string quartets (the sixth with orchestra), and various vocal works such as La Melancholia, Granum Sinapis, Dona Eis. He also wrote Sept études pour piano, A Quia concerto for piano, and seven solos for orchestra: Go, Extenso, Apex, Clam, Exeo, Reverso (premiered by the Berliner Philharmoniker and Simon Rattle) and Uncut. A new cycle for orchestra is in development and is inspired by nature. Morning in Long Island will be the first part, suggested by the shapes of the wind. Pascal Dusapin has been the recipient of numerous prizes and awards, including the Cino del Duca prize in 2005, and the Dan David Price in 2007. Also in 2007 he was granted the title of Academician at the Bayerische Akademie in Munich and became Artistic chairman at the collège de France, only the second composer after Pierre Boulez to hold the position. In 2010 and 2011 he was Guest Professor at Musikhochschule in Munich. Dusapin’s interests and passions are many, from morphogenesis to philosophy (with a particular interest in Deleuze), from photography, to architecture, to the theatre of Samuel Beckett, to Flaubert’s work, among others. He has collaborated with many different artists, combining his multidisciplinary talents with theirs: Sasha Waltz, James Turrell, Peter Mussbach, Laurence Equilbey, The Ac- croche Note Ensemble, the Berlin Philharmonic, Simon Rattle, and the Arditti Quartet. New projects have also brought him into the realm of electronics on a grand scale in such exceptional venues as the Grand Palais for the Monumenta by Richard Serra or the beach at Deauville for the 150th anniversary of the city. Mysterious, poetical, masterly: Listen to this lieder cycle and witness the documentation of an extraordinary encounter: Vanessa Wagner, Georg Nigl and Pascal Dusapin.